In another episode of the podcast, there is a video called Knowing When It’s Time to Redesign. In that episode, I walk through how to gather information that will help you produce an effective redesign of a website. In my case, I needed to redesign my website to better categorize the content. Over the last couple years I produced hours of content and had written over 80,000 words; all of that needed a better way to access the specific information. On the new website, there are now categories for each topic. If you want to learn about pricing your services, there’s a specific section for that, if you want to learn about how to start a business, there’s a section for that. As a quick sidebar, when producing multiple types of content, it is the most helpful to empower the reader with the ability to access content that peaks their interest. Showing the reader them everything and forcing them to sift through the information adds friction and makes things difficult. Too many times on the internet I see articles that claim to be the best information in the form of an Ultimate Guide. The Ultimate Guide to being an awesome entrepreneur and making a million dollars. Simply put the ultimate guide concept has been done to death. I’ve read many ultimate guides that contain basic information, or the information was very long with a lot of fluff. I recognize people’s time is important so rather than make an ultimate guide I want to make multiple guides from an honest perspective. I want to create guides that discuss the good, the bad, my successes/failures and make changes in their business immediately. Behind the scenes, I’ve been talking to many different creative professionals about how to accomplish their goals and bring their ideas to life. The most important thing I found is not the fact they need a website, but it’s the fact that they need a strategy. Coaching sessions are 30 to 45 minutes of listening to creative professionals and providing advice for quick wins they can implement immediately in their business. This will be fitting for those who have an idea but are still trying to figure out if the idea is worth pursuing or someone who is stuck in their business and needs direction. Based on much of the information I’ve seen from Kai Davis and Brennan Dunn, roadmapping a process in which you walk a client through the discovery process about what’s important in their business and how the specific creative work you’ll do will have an impact on their business goals. Roadmapping is something I already do for my clients, but it has always been a part of a larger scope of work. I recognize not everyone is ready to commit to a full project. Therefore, I want to offer roadmapping sessions so that what the client can either move forward those plans themselves or before with me but it’s breaking that out will allow me to meet with different people without a significant financial obligation to a more significant scope of work. I’ve spoken at three conferences about pricing and every time I talk about it I received an overwhelmingly large amount of compliments and people who are looking for answers in this area. Pricing is something that I had to figure out in my business through trial-and-error, however, I want to share everything I learned about pricing with other, so they don’t have to go through the errors that I’ve made. I thought a lot about pricing on the podcast. However, I see the need to go deeper in the subject area. 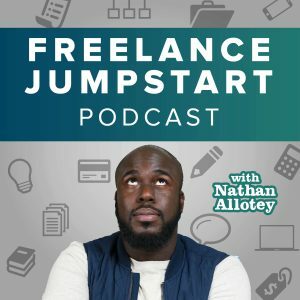 I’m still weighing different options, but it’s looking more and more like I will create a specific pricing course or add more lessons to the pricing module of the freelance jumpstart resource. Either way, this means more content on pricing so all creative professionals can get paid what they’re worth. One of the new aspects of the podcast will be a Q&A titled Traffic Talk. Houston, Texas has a lot of traffic, and my commute can easily get longer than normal. Rather than brood in traffic, I will answer questions from the audience during my commute.